As a runner, having made the switch to a plant-based diet in January 2013, it was particularly important to me that I didn’t lose any strength gains and I stayed strong, yet light, for best results when racing. Being a “number cruncher” I decided to use body composition scans to track the impact plant-based eating had, and my results were both empowering and gratifying. Body composition is a better indicator of health and fitness measurements than body weight, as it looks at your percentage of muscle and fat, the distribution on your body, as well as bone density. I have been getting an annual scan since 2012, which included a visit in January of 2013 right as I began a month long plant-based challenge. My results were so positive, the “challenge” has since turned into a lifestyle, and I’ve been eating this way for over 18 months now. I visited Bodycomp Imaging in downtown Vancouver which uses DXA (dual energy x-ray absorptiometry) technology. This process allows images and data to be produced from passing a small amount of x-rays, at two energy levels, through the body and measuring how well they transmit through tissue. Your technologist will help interpret your results which you can use as a baseline measurement. A follow-up scan is recommended 1+ months after consistently implementing changes, as a means of tracking your progress. Because changes in bone density take longer to appear, you may want to wait up to a year to reassess this measurement accurately. Can you get enough protein to maintain muscle when plant-based? When I went in for my scan in January 2013 I was satisfied with my body composition. I had already been eating clean, and exercising regularly, so my goal was to not lose muscle mass (and therefore strength gains) on a plant-based diet. My concern was a common one, “would I get enough protein to maintain muscle?” I was interested if an increase in protein sources which were also higher in carbohydrates (whether from pseudograins, grains or legumes) would result in higher body fat (from excess carbohydrates being stored as fat). I was also keenly interested in maintaining bone density as a pro-longevity measure. I can’t imagine my life without running, so my goal is to be able to run throughout my life. Brittle bones years from now would be a serious risk to this goal. Below are some of the excerpts from my Bodycomp Imaging report. I was really pleased to see maintenance in body fat percentage, and maintaining lean muscle. I attribute this to continued strength training, and proactively ensuring I integrated multiple sources of plant based proteins with each main meal, particularly post workout. The full report also includes a complete breakdown of body fat and lean muscle distribution to each specific region of the body. This can be really useful for determining symmetry, and identifying muscle imbalances. This can also help indicate if you have been compensating for an injury and developing non-symmetrical muscle tone as a result. I recommend looking for integrated health center which gives you access to personal trainers, physio or massage therapists, chiropractors, who can be valuable in determining a comprehensive recovery plan. This image shows the distribution of muscle (red), bone (blue), and fat tissue (yellow). As you can see I maintained the distribution of muscle and fat tissue, and have not increased abdominal fat which would have placed me at increased risk for diabetes and heart disease, particularly with a family history for the latter. Another great data point I used for comparison was bone density. The three white dots indicate the results of my last three scans. I had an improvement from 2012, when I started increasing vitamin D intake, which is a factor in calcium absorption. I maintained this improvement through a year of eating plant-based, by incorporating sources of calcium such as leafy greens, sesame seeds, tahini, figs, chia seeds and tempeh. The “T-score” indicates your results in comparison with others in your demographic profile. 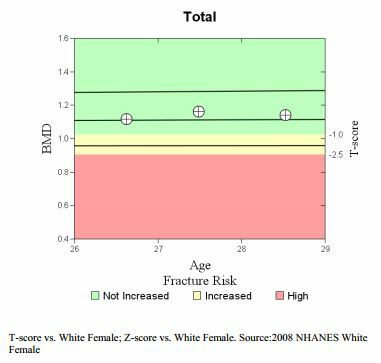 I would be at-risk for fractures and bone density loss if my results appeared below the yellow line. Between maintaining a body fat percentage in the “fitness” range for females under 40 (16-28%), maintaining distribution of lean muscle and body fat, and maintaining bone density, I have continued eating plant-based with confidence. I am also pleased to report that over the past year, I have shaved almost 10 minutes off my half marathon time! Clearly my performance has not suffered, and my results continue to empower me towards new goals.